I used to climb, hanging from the faces of Gower sea cliffs and welsh limestone in the Brecons. 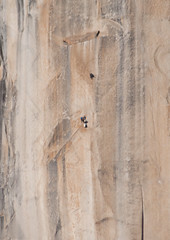 But I never would have climbed El Capitan. It's the Big Wall among big walls, sheer pink granite rising thousands of feet from the Yosemite Valley. If you're a world class fast solo free climber you can be up it in hours, but most take a couple of days to make their way up the smooth rock of its vertical faces. In Yosemite at the beginning of October we watched a small team half-way up the wall make slow progress across the exposed rock, inching up a crack to a ledge where they'd bivouac for the night. Tiny dots, smaller than ants. It gave you a sense of perspective, of insignificance. And of the beauty of it all. There was an article about this in National Geographic a few months back. The difference between the speeds of the people who first climbed these trails and the free climbers is scary. What took days to trail break first time up some of them do in an afternoon.